We’ll begin our kombucha making with a recipe that closely follows the method for brewing a classic kombucha made from sweetened tea. The only difference is that our base liquid is an herbal infusion rather than a tea infusion. You can easily substitute a different herb or tea in place of lemon verbena  if you like; you’ll still get a good handle on how to manipulate the various factors that affect the flavor, sweetness, acidity, and fermentation time of your kombucha. The geology in Copenhagen leads to hard, mineral-rich tap water, which can distort the flavor of the kombucha. We filter the water for our ferments with a reverse-osmosis system. If you live somewhere with softer water, there’s no reason tap water would harm your ferment, but if in doubt, filter your water. Kombucha doesn’t need much equipment other than a glass or plastic container of at least 2.5-liter capacity. Don’t use metal containers—they can react negatively with the acid in the kombucha; plus, you won’t be able to see what’s going on inside. A SCOBY needs access to oxygen, so avoid vessels with tapered necks, like carboys. Large, wide-mouth canning jars work fantastically; clear plastic buckets and tall Tupperware also do the job nicely. You’ll also need cheesecloth or a breathable kitchen towel to cover the vessel, and larger rubber bands to secure it. And as with any of the sensitive microbes in this book, the SCOBY is best handled while wearing nitrile or latex gloves. To begin, dissolve the sugar in a small amount of the water. (You only need a 1:1 ratio of water to sugar to completely dissolve the sugar, so heating the full amount of water is a waste of time. Plus, you’ll have to wait for the water to cool before you introduce your SCOBY—yeast and acetic acid bacteria can’t survive temperatures warmer than 60°C/140°F.) Bring the sugar and 240 grams of the water to a boil in a medium pot. Remove the pot from the heat, add the lemon verbena, and allow it to steep, uncovered, for about 10 minutes. Once the tea has steeped, stir in the remaining 1.52 kilograms water and strain the infusion through a fine-mesh sieve or chinois into the clean fermentation vessel. To jump-start fermentation and to help prevent unwanted microbes from getting a foothold, backslop the infusion by adding the 200 grams unpasteurized kombucha to your vessel (which is 10 percent of the weight of your other ingredients). Ideally, you’ll be backslopping with a previous batch of lemon verbena kombucha, or a complementary flavor. If this is your first batch, use the liquid that your SCOBY came packaged in. Stir well with a clean spoon. 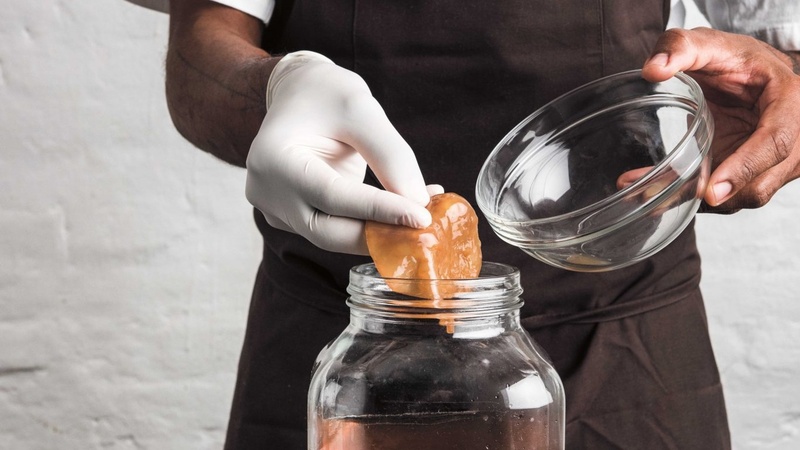 Put on your gloves and carefully place the SCOBY into the liquid. It should float, but don’t worry too much if it sinks—it sometimes takes a day or two to rise to the surface. Cover the top of the fermentation vessel with cheesecloth or a breathable kitchen towel and secure it with a rubber band. Fruit flies love the scent of acetic acid and alcohol, and will be particularly drawn to your new kombucha, so you’ll want to do everything you can to keep them out. Label the kombucha with its variety and the start date so you can easily keep track of its progress. SCOBYs work best in slightly warm settings. If you’re brewing in the summertime, you’ll probably notice that your kombucha finishes faster than in the winter. In Noma’s fermentation lab, we keep our kombucha room at a steady 28°C/82°F to encourage speedy production, but you don’t need to dedicate a whole room of your house to kombucha. It will ferment just fine, albeit slightly more slowly, at room temperature. If you like, you can place your kombucha close to a radiator or on a high shelf in the kitchen to provide an environment that’s slightly warmer than room temperature. As the days go by, you’ll notice the SCOBY growing significantly, fueled by the sugar in the liquid. Every other day or so, peel back the cloth covering enough to get a good look at the SCOBY. It should extend out toward the sides of your vessel, while also thickening in the middle. You may also see it puffing up in some areas as the yeast releases carbon dioxide. If you notice the top of the SCOBY drying out, use a ladle to pour a little liquid over it. The liquid keeps the SCOBY acidified, staving off mold growth. There are a few different ways to measure the progress of the kombucha itself. The simplest method is one you’re already well equipped for: Taste it. At Noma, we look for our kombuchas to maintain the essence of their base ingredient, while developing complexity and a harmonious opposition of sweetness and acidity. Put more simply: It’s done when it tastes good. The kombuchas we brew at the restaurant usually take 7 to 9 days to ferment to our desired taste. If you enjoy sour kombucha, then let it ferment for an extra day or two. In the fermentation lab, we use equipment to measure the acidity and sweetness of our kombuchas in order to maintain consistency from batch to batch. A refractometer allows you to track sugar levels in the brew. Taking a measurement in the beginning lets you know how much sugar you started with, and each subsequent measure tells you how much is left. A pH meter or pH strips gauge acid content. Infused lemon verbena syrup will begin with a pH of just under 7, which is close to neutral. Backslopping with a previous batch of kombucha should drop the pH to about 5. Fermentation further increases the acidity to between 4 and 3.5. If you’re equipped and inclined, keep track of your kombucha’s progress and measure the pH and sugar content of the final product so it’s easier to replicate. If colorful (pink, green, or black) mold shows up on your SCOBY, it means your base liquid probably wasn’t acidulated enough at the outset. (Though a healthy SCOBY may develop slight variations in color.) Don’t try to salvage the liquid or SCOBY in this instance, as pathogenic molds can produce harmful toxins that dissolve into the liquid. Trying to identify whether an invasive mold is malignant or benign isn’t worth the risk. You can always brew more kombucha. Once you’re satisfied with your kombucha’s flavor, put on a pair of gloves and remove the SCOBY. Transfer it to a plastic or glass container into which the SCOBY fits snugly, and cover with three to four times its volume in kombucha. Cover the container with cheesecloth or a breathable kitchen towel, and secure it with rubber bands. It’s fine to let the SCOBY hang out at room temperature if you intend to make another batch within the next few days. If you’re not using the SCOBY again soon, store it in the fridge until you’re ready. Strain the remaining kombucha through a sieve lined with cheesecloth or a fine chinois. Now you can enjoy it straight away, or save it for later consumption or use in a recipe. Kombucha will keep in the fridge in a sealed container for 4 to 5 days without much change in flavor. You can also freeze it in an airtight plastic container or vacuum-sealed bag if you’ve made a larger batch than you can use immediately. To freeze your kombucha, chill it in the fridge for a few hours to slow fermentation before packing it into the container or bag, or it could inflate and even burst before freezing solid.It may take you a couple of tries to nail a kombucha you’re happy enough with to take to work or school. That’s fine! You can still use overfermented kombucha for syrups. Meanwhile, your SCOBY will happily dive into a new batch, so keep trying. 1. Water, SCOBY, lemon verbena, sugar, and finished kombucha. 2. Make a syrup using the sugar and an equal weight of water. 3. Combine the syrup and lemon verbena and allow to steep before adding the remaining water. 4. Strain the infusion through a fine-mesh sieve into the clean fermentation vessel. 5. Backslop with the unpasteurized kombucha. 6. Place the SCOBY into the fermentation vessel and cover. 7. Measure the sugar content using a refractometer (optional) and check again after 7 days. 8. Use pH strips to check the acidity of the kombucha. When the pH has reached 3.5 to 4, the kombucha should be close to ready. 9. Remove the SCOBY. Strain and bottle the kombucha. Almost any kombucha can be cooked down to a remarkable and complex syrup, but it works especially well with kombuchas that are approaching the point of being too sour. Pour about 450 milliliters of kombucha into a medium saucepan on the stove over medium-low heat. Let the liquid slowly evaporate until it’s about one-quarter of its original volume and can coat the back of a spoon. The slower the kombucha reduces, the better—don’t let it come to a boil or you’ll cook out all the flavor. The next time you cook a batch of pancakes, drizzle a bit of this syrup over the top. It won’t be as sweet as maple syrup, so if you have a sweet tooth, you may want to add a dusting of powdered sugar. As a dessert, spoon some lemon verbena kombucha syrup over good-quality ice cream. Bonus points if you sprinkle freshly picked lemon verbena on top. Blending together equal parts mild oil, such as virgin rapeseed or avocado, and lemon verbena kombucha syrup will produce a thick vinaigrette—sweet, sour, and creamy. You’ll need to taste for salt and acidity and adjust accordingly, but the result is an exceptional dressing for root vegetables. For a first-rate side dish, toss salt-baked beets in the vinaigrette and garnish with torn fresh basil leaves and chopped pistachios. Bottling kombucha will extend its shelf life and encourage carbonation. A day or two before you’re happy with the flavor (gauging this point will come with experience), strain the liquid, transfer it to sterilized swing-top bottles (or regular beer bottles, if you have a capping tool), and move them to the refrigerator. The residual bacteria and yeasts in the liquid will continue to work, even in the fridge. Bottling traps the gases from fermentation, some of which will dissolve into the liquid. A kombucha fermenting in open air will have a slight effervescence, but bottling will increase the bubbliness. Take care not to bottle your kombucha too early. If there’s too much residual sugar in the kombucha, it will fuel an excess amount of carbon dioxide production, which can result in exploding glass bottles. To mitigate this risk, make sure your kombucha is close to where you want the finished product before bottling—around 8°Bx, if you’re measuring with a refractometer. Be sure to keep bottles in the fridge and consume them within a couple of weeks.